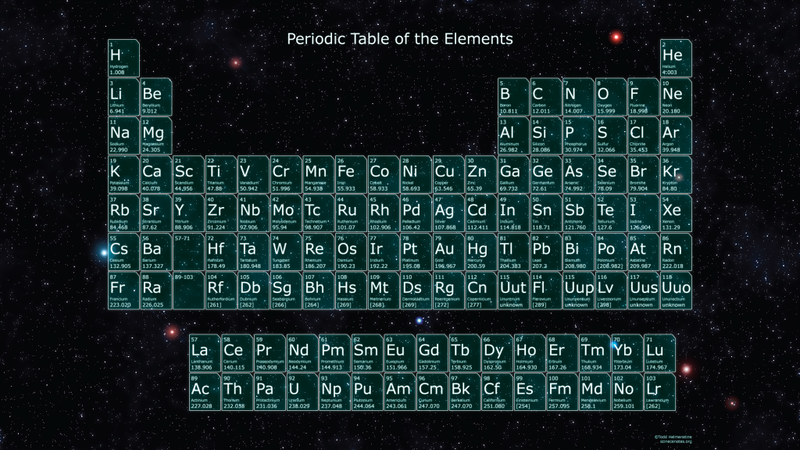 These free periodic table wallpapers are perfect for your HD widescreen devices. Most are optimized for 1920×1080 resolutions and can easily be read on any screen. A few of the tables are set to 4K resolution (3840×2160). 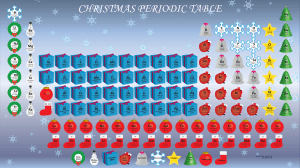 There are a variety of different tables with specialized elemental information, various color schemes, holiday themes, and unusual periodic tables. 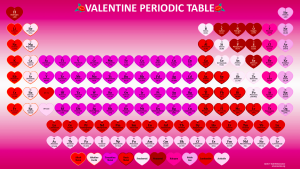 You can also print the wallpapers as printable periodic tables. 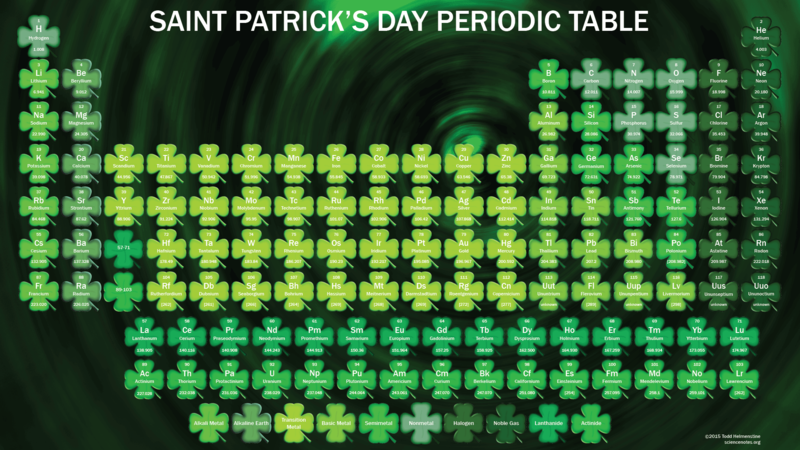 Click the individual table to view the full-sized wallpaper to save. Clicking the title will take you to a page containing that table and any PDF files associated with the wallpaper for printing offline. Other color variations for that wallpaper will also be presented on its page. If there is a color variation you would like, but we don’t have it listed, please let us know and we can make it for you. We can also alter the table for other aspect ratios, upon request. 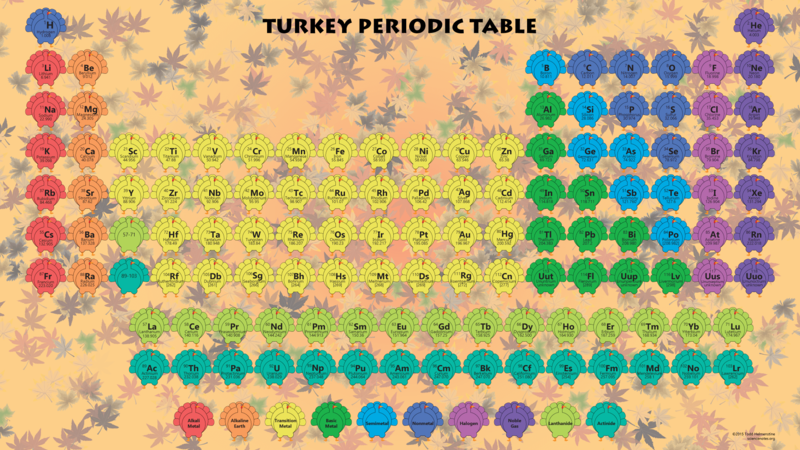 This printable periodic table wallpaper is the most brightly-colored table we have made. The original version of this wallpaper can be found here and over on thoughtco.com (formally About.com Chemistry). The newer version is higher resolution, so it looks better on a screen. It also prints more cleanly. All this, plus we made the file size smaller! Who says the element tiles have to be rectangles? This mod periodic table wallpaper was made using round tiles. Don’t worry. All the usual facts and figures are still there. Mix it up a little. Available with dark background too. 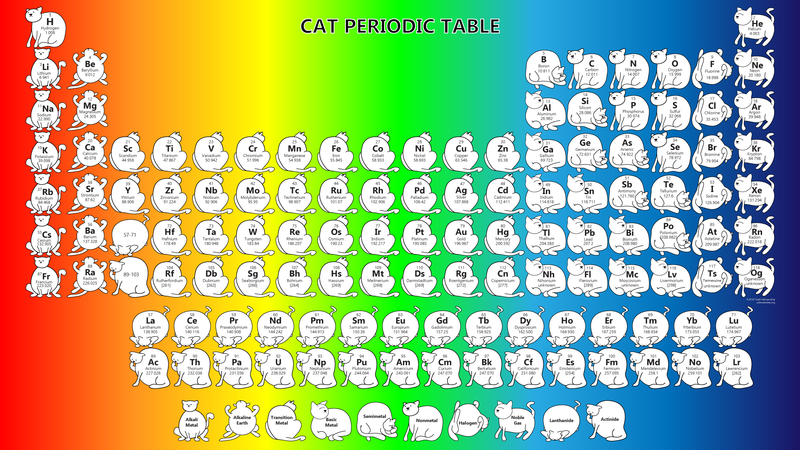 This chart features a variety of cat shapes, each indicating an element group. Why cats? The internet loves cats. Share your love of the elements with this periodic table wallpaper has different colored hearts for the different element groups. Geek up your Halloween with this Periodic Table Wallpaper. 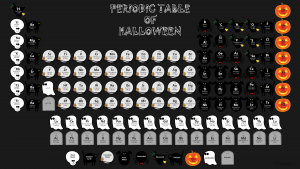 Each element group is represented by a different Halloween themed icon. Our original color periodic table wallpaper. 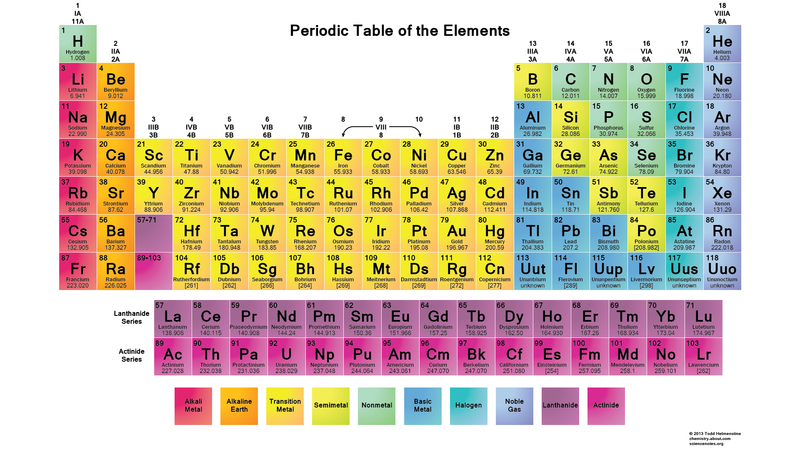 This periodic table is a colorful wallpaper with the atomic number, element symbol, element name and atomic mass. Different colors represent different element groups, with an element group key included at the bottom of the table. 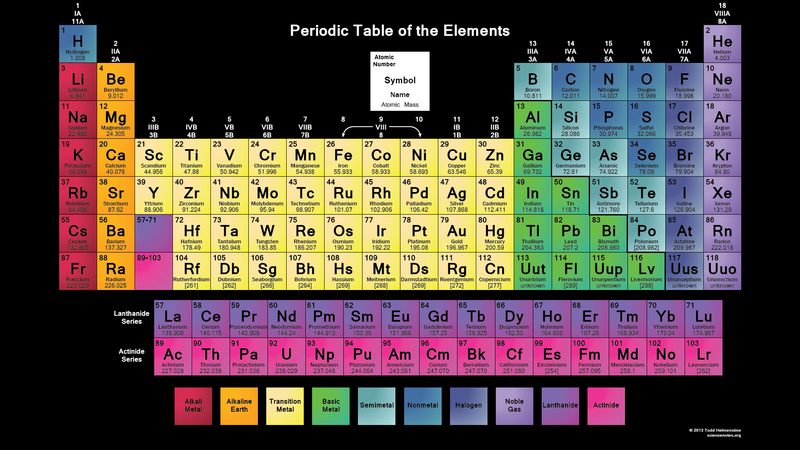 The colors indicate major trends in chemical and physical properties of the elements. This was my first table on the site and it’s shown up all over the internet. Grab the classic! Visit the classic table’s page for different versions of this wallpaper, including other color schemes. This wallpaper is much like the one above, but more in line with the ROY G BIV color scheme as you move across the table. Taste the rainbow! The same table with a white or transparent background is also available. 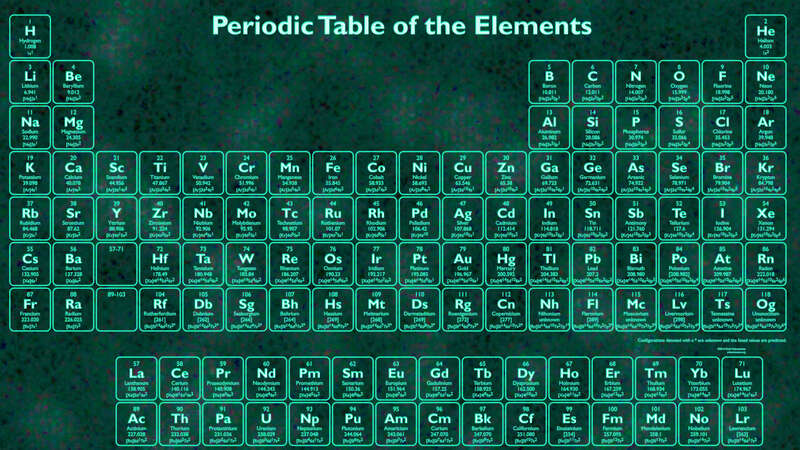 The element tile below the title is a key for reading element facts from the table. 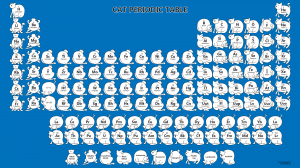 This is a 2015 printable periodic table. 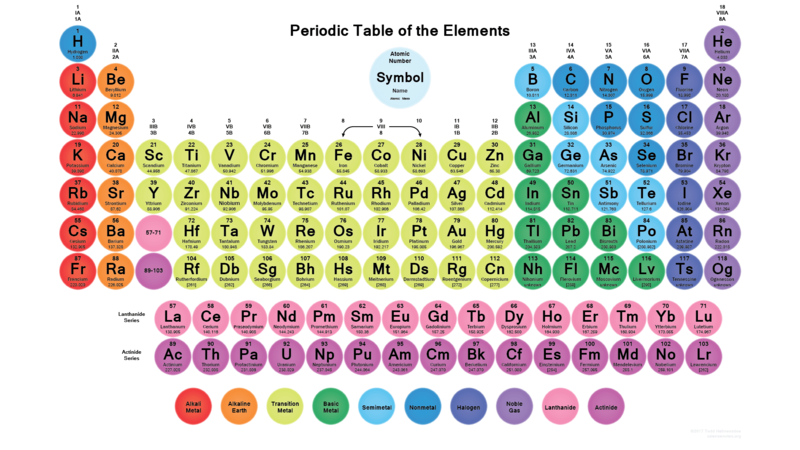 This periodic table wallpaper is a colorful chart containing atomic number, symbol, name and atomic mass. Different colors represent different element groups. This background is transparent and suitable for any light colored backgrounds. There is also a dark background version. 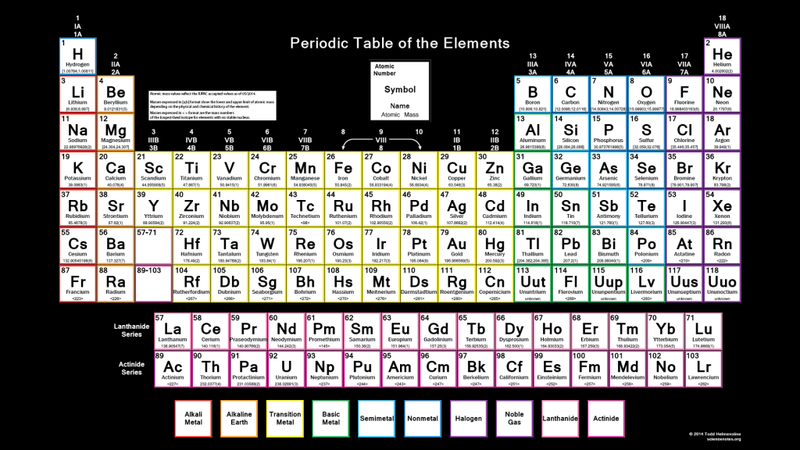 This table is nice because there’s a bit of space between the element tiles, so it’s easy to read. 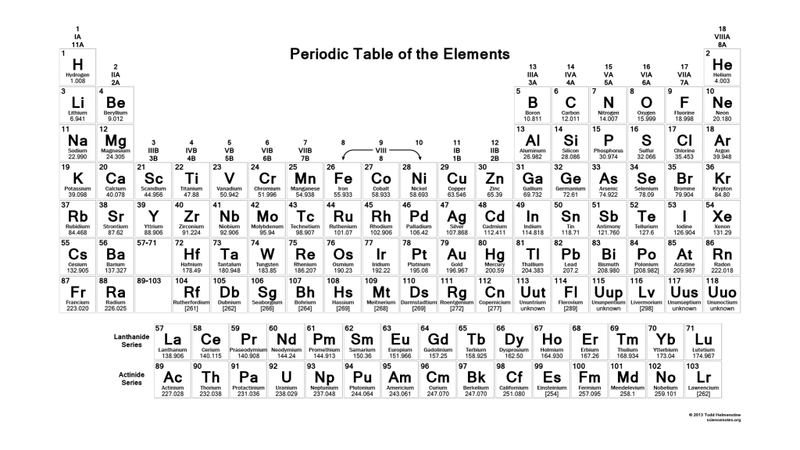 This table is your basic black and white periodic table wallpaper. 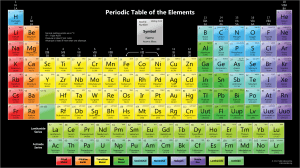 It offers element names, symbols, atomic numbers, weights, and groups. The uncluttered graphic is especially easy to read and copies well for handouts. It also gives you the opportunity to color in element groups to practice recognizing them (though they are labeled, so it should be pretty easy). 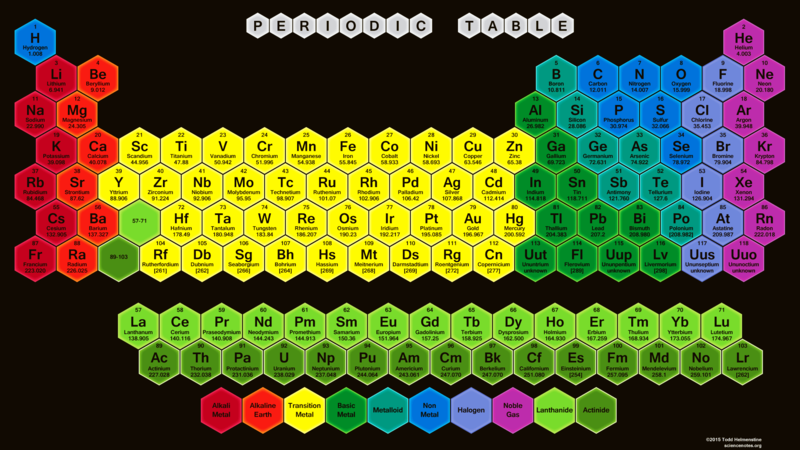 This periodic table is lightly colored and easy on the eyes. 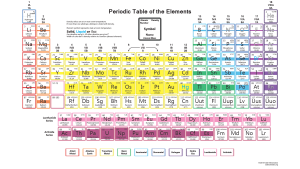 This color periodic table wallpaper uses a muted color scheme that is easy on the eyes, so you can have your pretty colors and still read the data. The wallpaper is available with a transparent background (shown) or a black background. 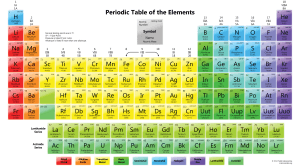 It includes all the usual data: element groups, atomic numbers, atomic weights, symbols, and element names. It’s probably the easiest color chart to read on printed paper. This is the most recent offering on Science Notes, with data retrieved from the IUPAC in September 2015. It’s perfect for working homework problems. It looks a lot like its earlier version, except this one is cleaner, more accurate, has a smaller file size, and resizes even better. You’ll see what I mean if you compare the old and new versions side by side. 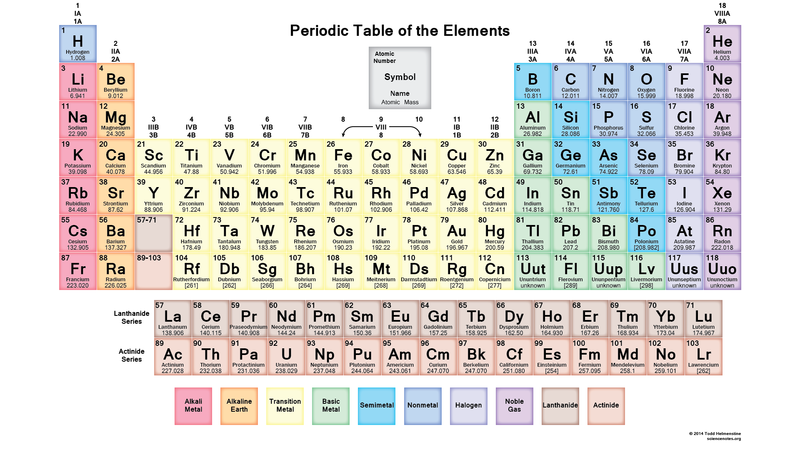 This periodic table has it all: atomic number, atomic mass, element symbol, element name, electron shell population per energy level and electron configuration. Colored cells show the element groups of the elements and colored element symbols show the state of the element at room temperature. Need more facts? Let us know which ones you’d like to see added. 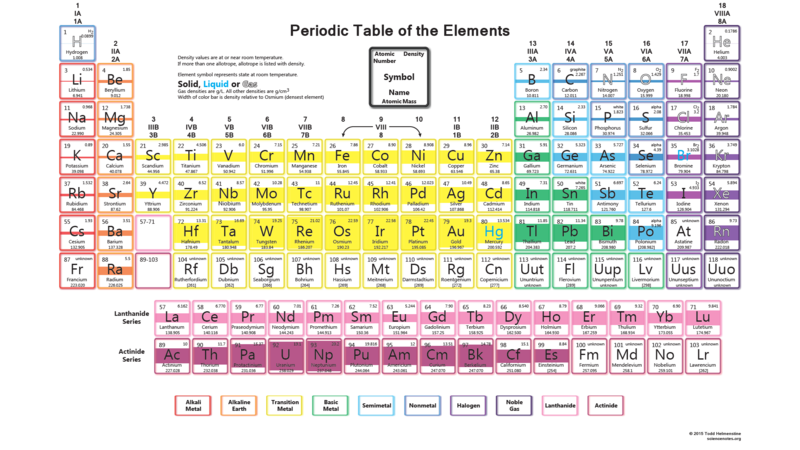 These printable periodic table wallpapers look glowing, like they were drawn using highlighters, or slightly radioactive, depending on the color you choose. So far, your color options include red, violet, gold, green, blue, and vivid yellow. If there is another color you’d like to see, just let me know and I’ll add it. You could print using phosphorescent ink and it would truly glow. Don’t use actual phosphorus. Just sayin’. 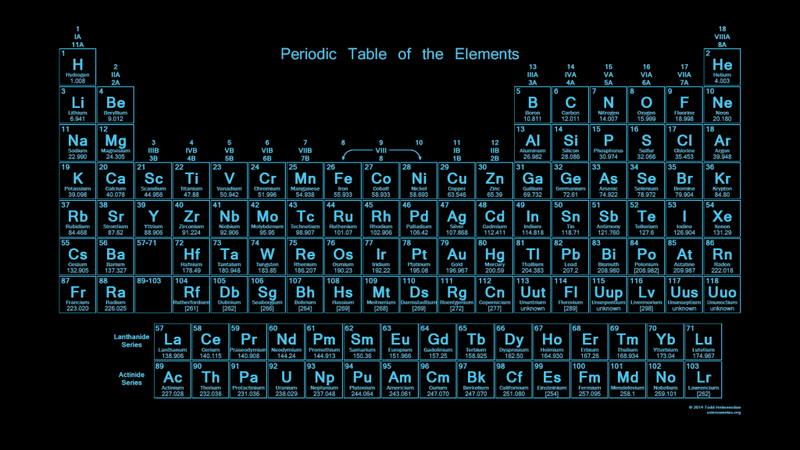 Here is another HD periodic table wallpaper for your desktop, laptop, or mobile device. This one features translucent element tiles and a space-theme background. We think it has a futuristic look. Open the image and right-click to save it to your device. 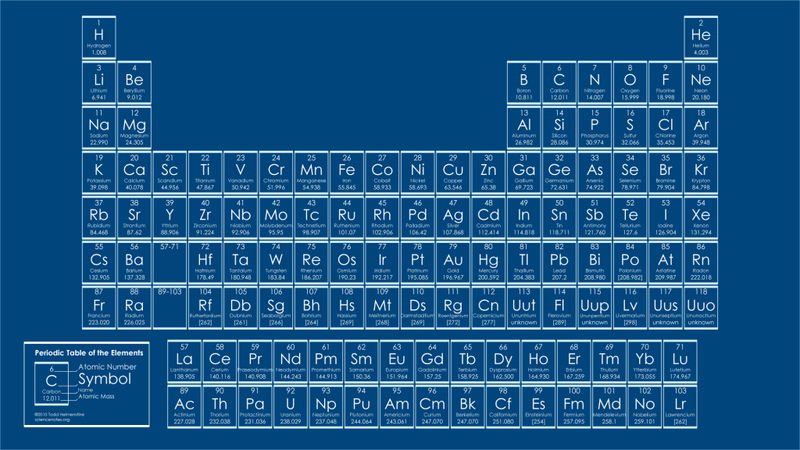 This 1920×1080 periodic table wallpaper looks like a blueprint with the dark industrial blue background and light blue/white text. 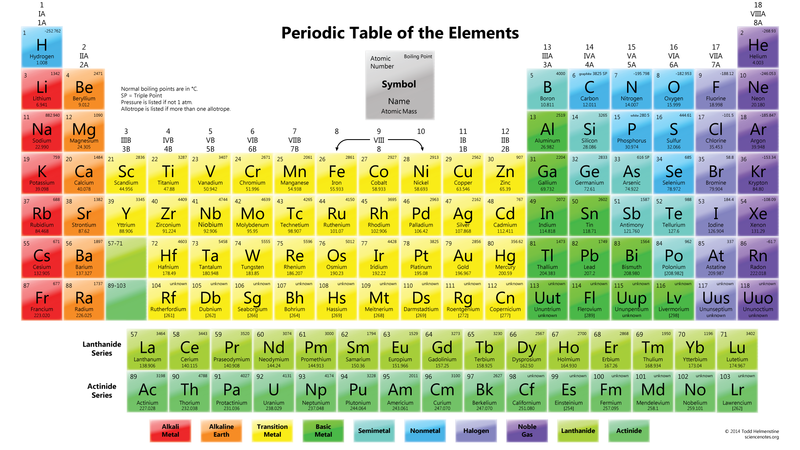 This periodic table has an old-style technical feel to it. Print it and hang it as a classy decoration for your office. 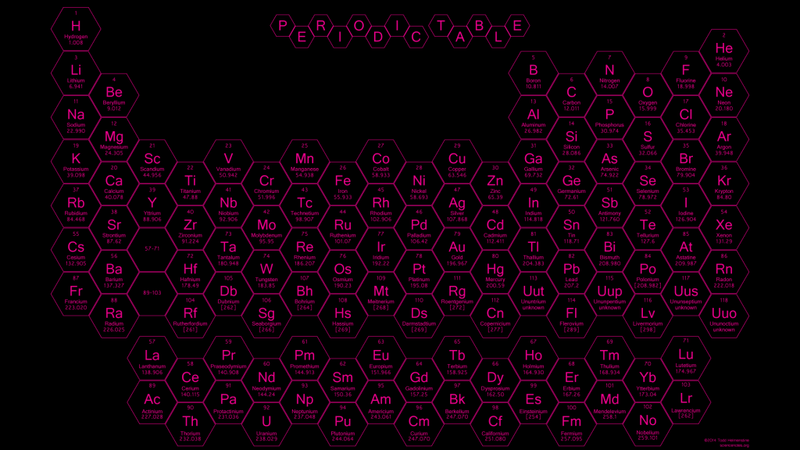 This periodic table wallpaper is a little more artistic than the others. It looks particularly nice on widescreen monitors. Each tile is a 3D brick with the element data on one face. 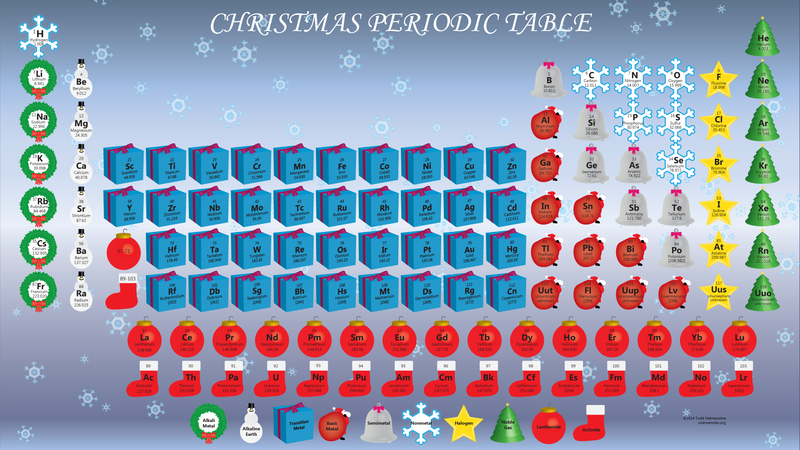 We made sure you could still read the element data to use the table for chemistry calculations. No, it doesn’t actually glow in the dark. It does have that cool glow in the dark color bright on a slightly glowing background. If you really wanted it to glow, I guess you could print it using phosphorus (dangerous) or a phosphorescent ink (safe). High contrast color strips make a cool and colorful wallpaper. Dark tiles on dark rough background with high contrast color strip to designate the different element groups of this wallpaper. 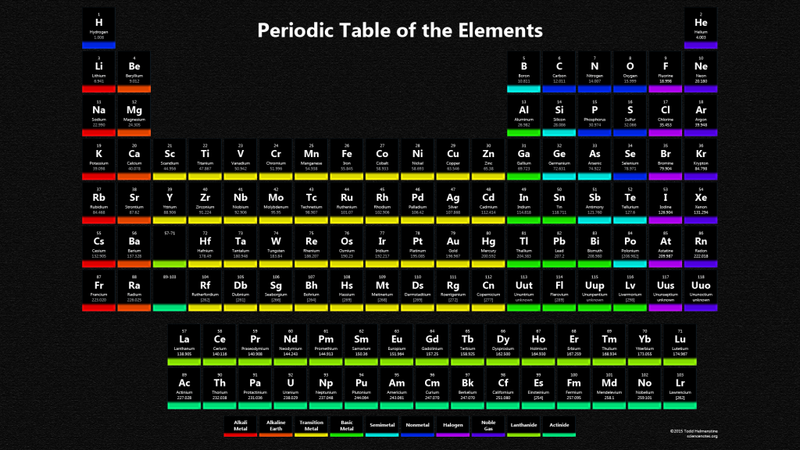 This is a color periodic table wallpaper with a neon border color scheme. It is available with a light or dark background. 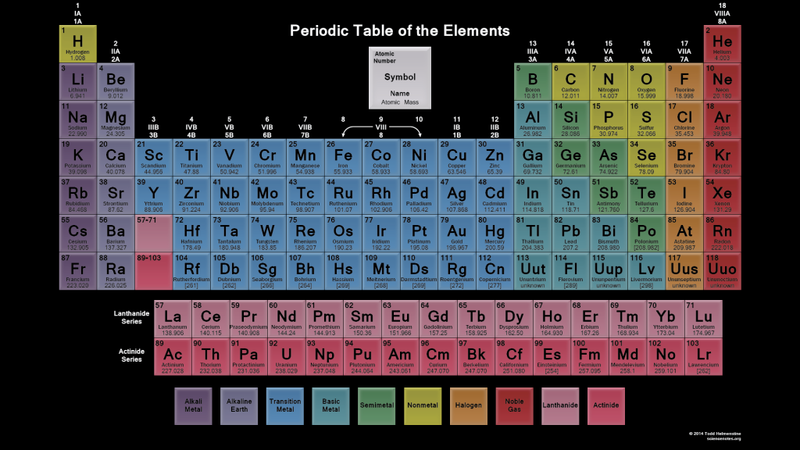 It’s easy to read the element facts, since there is no tint in the data field. 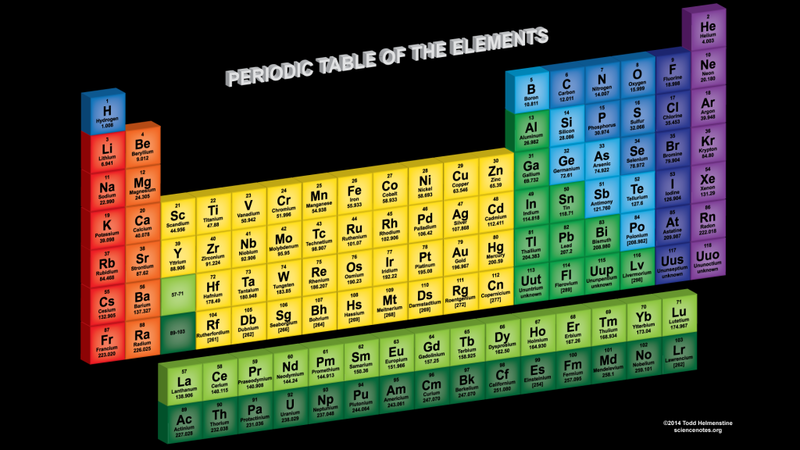 This high-contrast periodic table wallpaper has a glass tiles effect for each element. It’s vivid and easy to read. 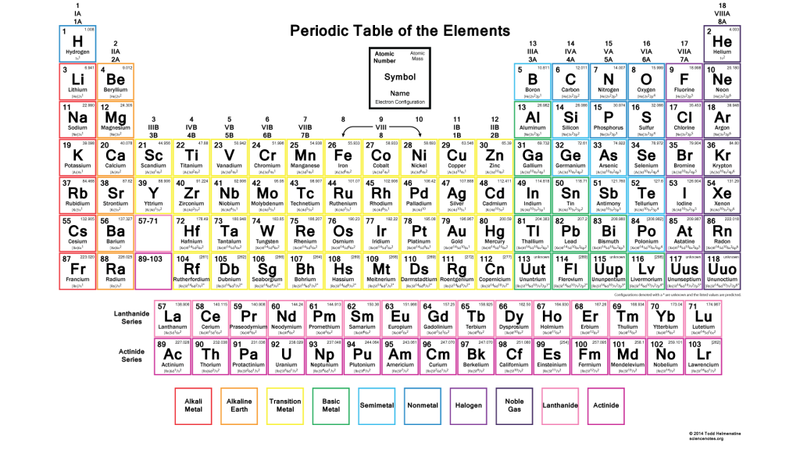 You’ll find element symbols, names, groups, atomic numbers and atomic weights. Choose from the black or white background. These periodic table wallpapers are similar to the Glowing Text periodic tables above except the tiles are hexagons arranged in a honeycomb pattern. Try something different from the usual rectangular tiles. If you liked the hexagon tiles in the previous set, this has the same idea, but the hexagons are rotated so they are pointed at the top instead of the sides. This allows them to be arranged side to side without moving up and down as you read across the table. There are 10 different colors schemes to choose from. The honeycomb pattern wallpaper is one of our more popular wallpapers. Here is a colored hexagon version where the colored tiles represent the different element groups. Same data, different look. This free periodic table wallpaper features the atomic weights of the elements using the most recent accepted values and significant figures from the International Union of Pure and Applied Chemistry (IUPAC). Suitable for all fans of significant figures. Some elements stick with one oxidation state. For example, the alkali metals usually have a +1 oxidation. 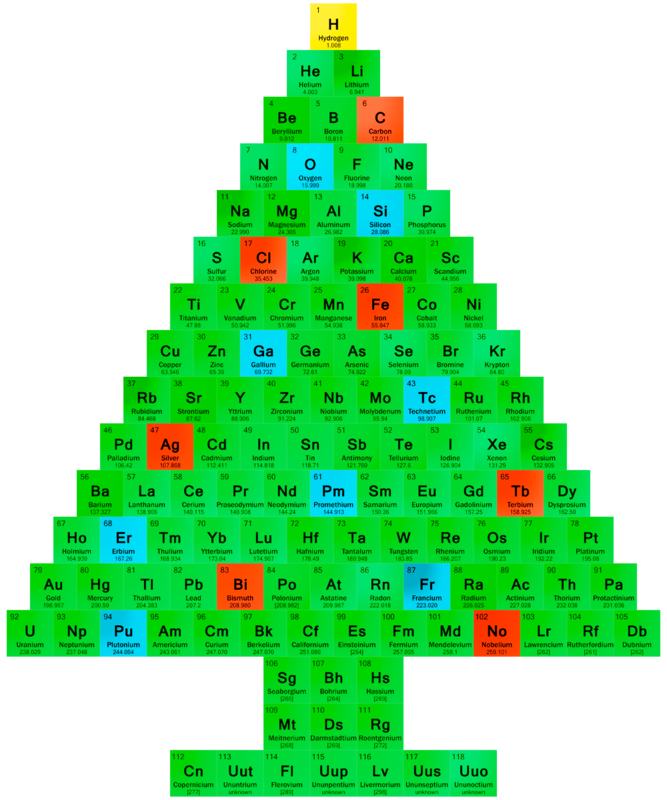 Other elements, like the transition metals, exhibit many oxidation states. 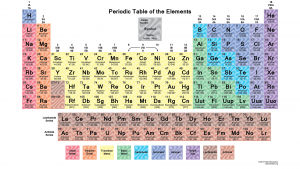 This periodic table displays the most common oxidation states for the elements. Dark background is also available. The above table has all the possible oxidation states. 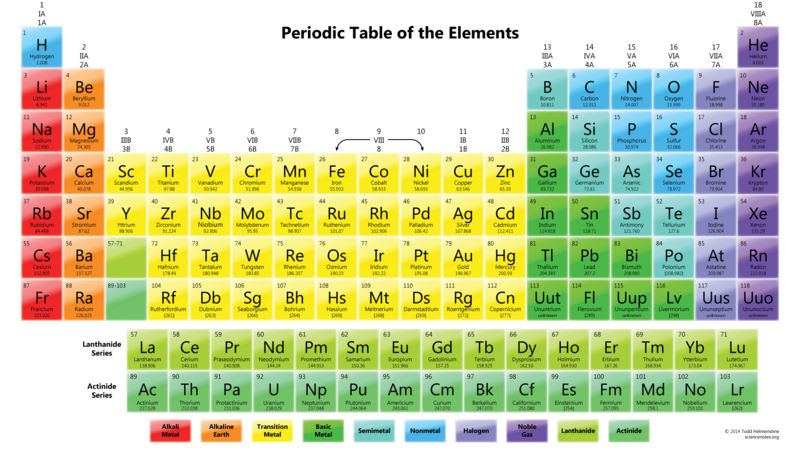 This wallpaper lists just the most common charges carried by atoms of each element. The table is available with either black or white backgrounds. 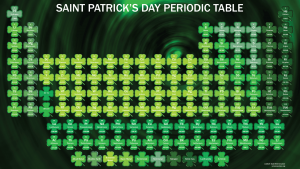 Show off your green with this St. Patrick’s Day periodic table wallpaper. 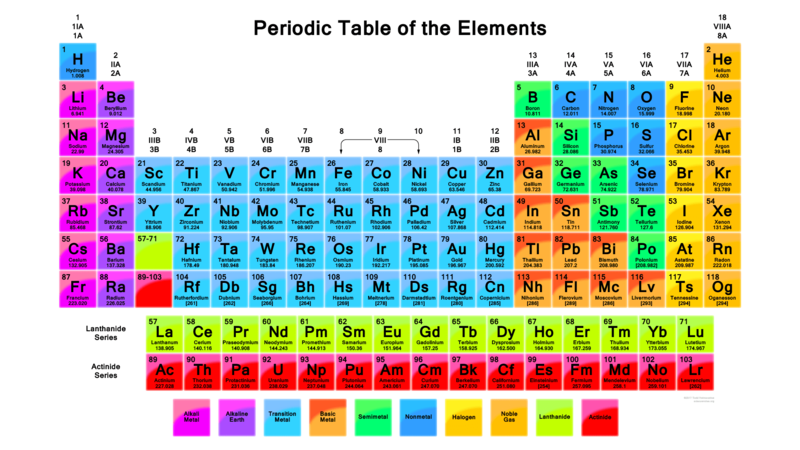 Each element group is represented by a different four-leaved clover containing each element’s atomic number, symbol, name and mass. All on a green and black background. 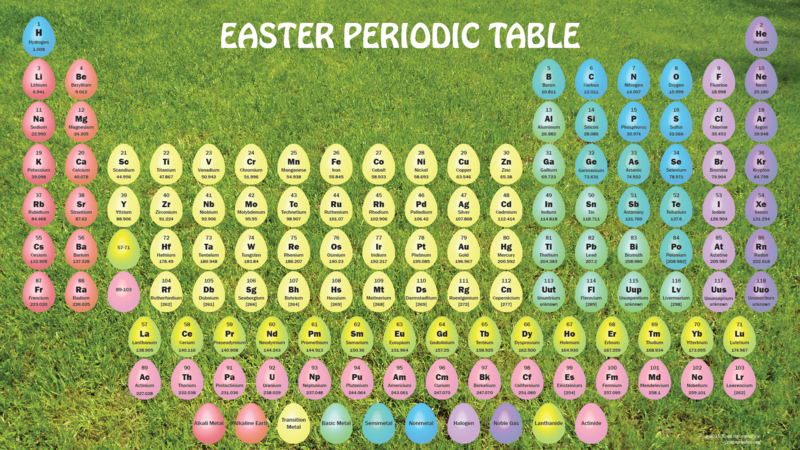 Hunt your favorite element with this periodic table Easter Egg Hunt. 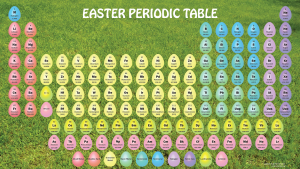 Each egg contains an element’s number, symbol, name and atomic weight. Halloween is over, so change your Halloween table to a Thanksgiving themed table. 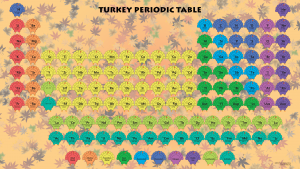 Each element is represented by a colored turkey with the usual atomic number, symbol, name and atomic mass. It’s the table of choice for November, unless you live in Canada, which celebrates Thanksgiving earlier than the US and probably loses autumn leaves a bit earlier too! 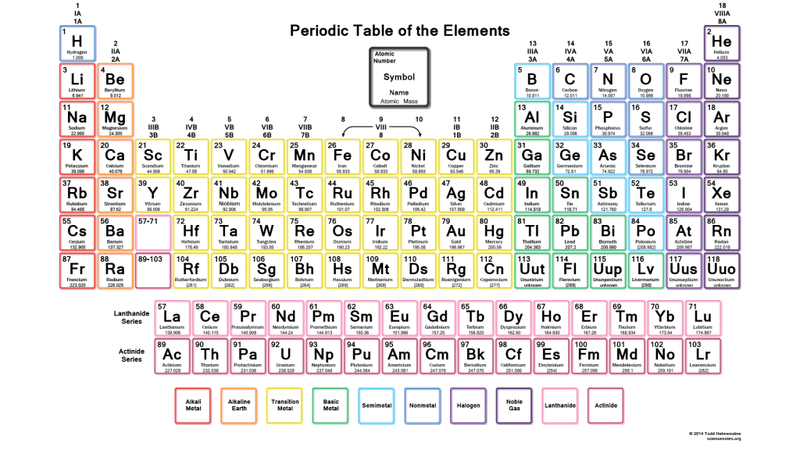 This table has the usual atomic number, symbol, name and atomic mass, but it also contains density information for each element. The cells contain a band of color scaled relative to the densest element, osmium. This colorful table contains the atomic number, symbol, name, atomic mass and normal melting point for each element. It comes with either the black background (shown) or else a transparent background, which appears white on a monitor. Like the table above but prefer the gas phase to the liquid phase? Try the periodic table with normal boiling points. This table incorporates a fun moire effect into the table cells. It’s functional, as well as decorative, with all the facts and figures you need from your printable table. It’s available with your choice of a black or white background. This periodic table wallpaper contains the usual element data and the electron configurations for each element. Also available with a dark background. 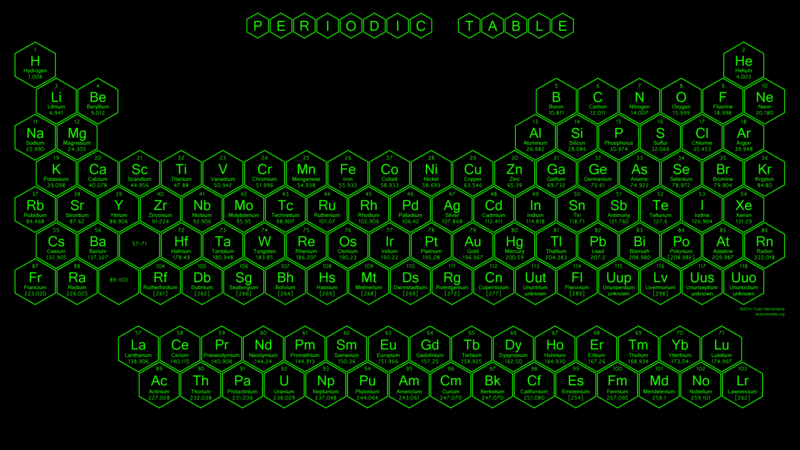 This is the first version of the muted colors periodic table and the most popular wallpaper on the site. The updated (more correct) version was listed earlier. All of these tables are copyrighted. You’re welcome to print them and hand them out to students or save them to your computer or mobile device, but we do not permit displaying any of our tables on your website. If you don’t see a table that fits your needs or have something special in mind, get in touch or leave a comment and we’ll see if it’s something we can do. We can also re-color any of these tables pretty easily, since we have the original files. Very nice collection! Had the Halloween one and a Coloured one. I love the Glowing and Futuristic ones. Maybe Glowing and Futuristic (maybe even others) with electronic configurations would be even better!